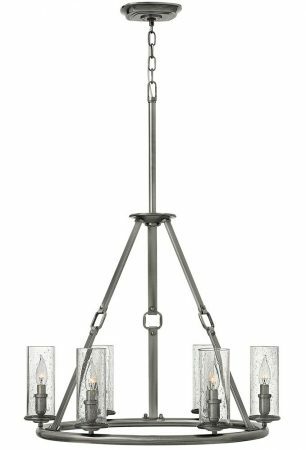 This Hinkley Dakota 6 light chandelier with seeded glass shades in polished antique nickel finish features rustic chic, with faux leather straps and buckles to create a sleek, elegant design with a modern timeless look. A medium chandelier featuring a detailed ceiling cup, chain suspension and rod attached to the polished antique nickel frame, with four metal straps attached to a large hoop. The straps are fashioned in the style of a leather belt with a buckle in the centre and the hoop features six candle style lights, with tall clear seeded storm glass cylinder shades. 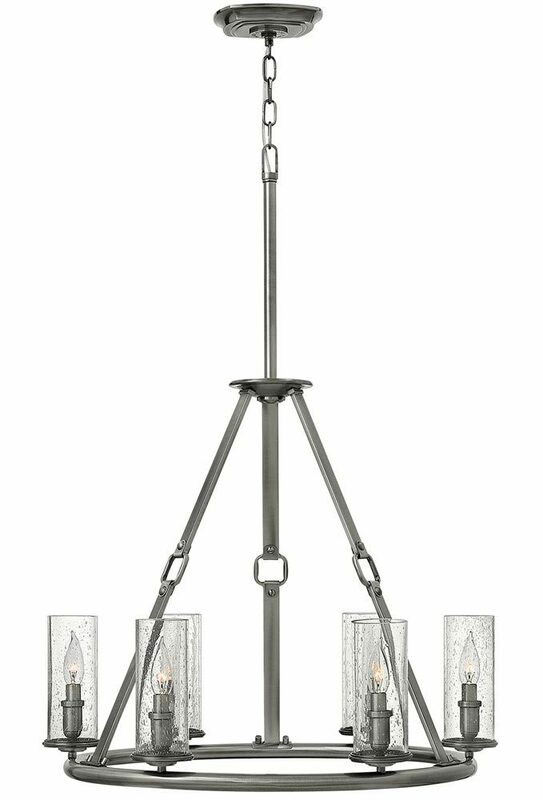 The strong geometric proportions of the body, seeded glass shades and polished antique nickel finish combine to create a stunning medium sized chandelier of impeccable style, quality and detail. The ideal centrepiece for any large living room, dining room or hallway with sufficient ceiling height. Supplied with 152cm of chain suspension that can be shortened at the time of installation to achieve the desired drop; please see below for dimensions. Please ensure that you have sufficient ceiling height for installation prior to purchase. There are coordinated fittings available in the Dakota rage that includes a three-light hanging lantern, eight-light chandelier and single wall light; please see below. This timeless light is supplied by Elstead Lighting and designed in the USA by Hinkley, founded in 1922 in Cleveland, Ohio. 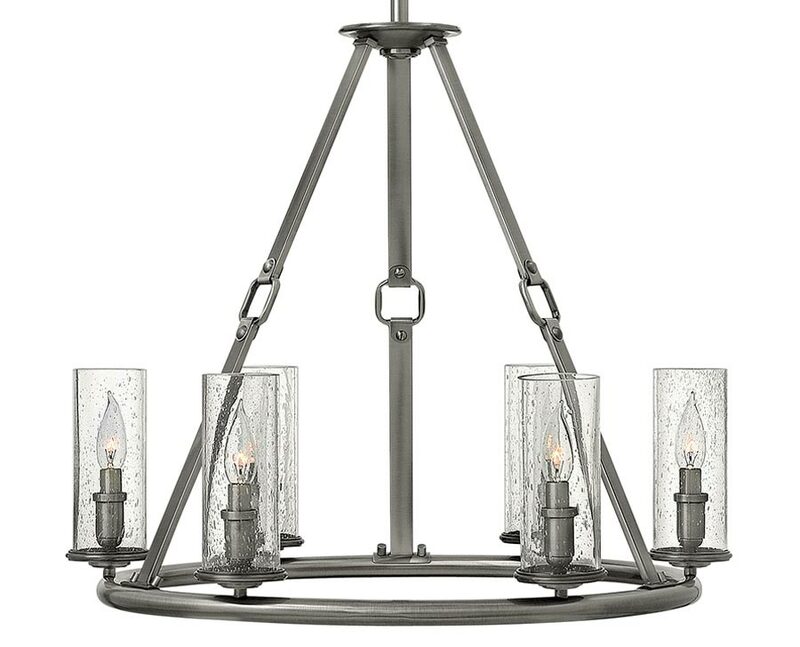 They have transformed from a small outdoor lantern company to a global brand intent on bringing you the best in style, quality and value designs like the Dakota 6 light chandelier with seeded glass shades in polished antique nickel finish featured here.